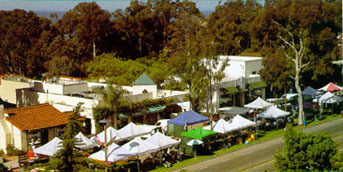 The Montecito edition of Farmer's Market is a colorful addition to Coast Village Road Shopping, beginning at 8:30 a.m. every Friday. They are understated and low key. They don't announce themselves. It's not unusual, in fact, for first-time visitors to drive into the area and wonder if they have, perhaps, missed something. A quiet casualness and a solidity born of time distinguishes both of Montecito's retail districts from that of Beverly Hills' Rodeo Drive, a prominent neighbor to the south and one to which the area's retail quality is most often compared. But both Coast Village Road and the Upper Village are products of their location and their history and have grown up and into their respective roles like well-behaved children from prominent families, which, in a way, they are. In 1877, a grocery store was the big draw to what is now referred to as the Upper Village, the area intersected by East Village and San Ysidro roads. A center for commerce and congeniality, it was eventually joined by dressmakers, a temperance lodge, the Montecito Meat Market and a post office. The Presbyterian Church and the library came along in short order and remain vital organizations to this day. A village in the truest sense of the word a century ago, it retains, as much as possible in high-speed techno '90s, that charm and atmosphere today, still attracting a unique mix of high-end retailers. Coast Village Road, which runs parallel to Highway 101 between Hot Springs and Olive Mill roads, was Highway 1 in its former life and, as part of the main artery on California's coastal route, served the motoring public with gas stations, a restaurant or two and overnight accommodations. It still provides all of those conveniences and more. CVR, as it's often called by the locals, has more the feel of boulevard shopping. Park at either end and you can spend the afternoon or the day poking in its variety of shops, stopping at any number of establishments along the way for mid-morning coffee, lunch, afternoon tea, drink or dinner. While Montecito's reputation as an enclave for the rich and famous may conjure up images of museum-like stores with price tags that defy gravity, the fact is that reasonably normal people live and work and, yes, do their shopping here because it's unhurried, convivial and convenient. All the same reasons people shopped in the area a century ago. It's good that some of the best things don't change.